It's been nearly a year since we lost our way as a nation and elected a radical socialist to lead us out of financial crisis that still has not been solved. As the Republican party nominated John McCain from a group of candidates, none of whom had all the traits necessary to be the leader Ronald Reagan was but all of whom individually possessed a different trait needed to lead, it had appeared that liberty's lamp was about to go dark. Faced with the prospects that the liberals could have finally reached their moment of triumph, traditional Americans silently sulked in the disappointment that had become a Republican party that had given in to the allures of big government spending. Then suddenly there was light. 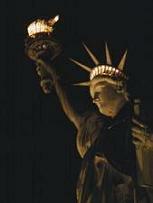 While the lady who appeared and took hold of liberty's lamp was able to keep the flame lit, it just wasn't the right time to move forward yet. The majority was silent as the main stream media bashed the values of traditional America and those who espoused them. She came in triumph and was hailed by the base as our next great hope; but the foul winds of AstroTurf smear campaigns, media complicity in the election of Obama and the inability of the electorate to recognize someone who truly embodied what they wanted was enough to keep the holder of the lamp stymied. Mitt Romney had the charisma, Fred Thompson the philosophy, Rudy Giuliani the national defense and anti-terrorism savvy, Mike Huckabee the religious and social views, John McCain the war hero status and Ron Paul the libertarianism. It's too bad we couldn't have combined them all into one candidate. Then John McCain discovered someone who was that one candidate. Without the time necessary to get people to really know who she was, it was too late for that candidate to carry us home in 2008, but she came pretty damn close. Bill Bennett said that because of the economic crisis, McCain couldn't have won the 2008 election with Ronald Reagan on the ticket. I think it's fair to say that's basically what happened. Like sheep suddenly realizing they were in the shearing pen, the majority was silent no more. They took to the streets with signs protesting big government. They showed up at town hall meetings and confronted their leaders, demanding answers not lies. They all showed up in Washington, DC to tell the government "we're not saying no, we're saying hell no" to the corruption and the flushing of our taxpayer dollars down a toilet bowl labeled "stimulus plan." The "mob" as they are mockingly called by their detractors is a growing army that once seasoned will be stronger than any special interest group, any lobbyist or any corporate conglomerate. This army will make the founders misty eyed with joy in Heaven as they overlook their great experiment finally doing what they wanted it to do: having the people impose their will on the government and not the other way around. Sarah Palin has risked her reputation by resigning as Alaska governor. She has taken on the ridicule and scorn of the left. She has locked herself away with books and a lap top, not simply learning talking points that she can use in running for office, but researching and digging deep into the existential mysteries and truths of what makes our country tick and what it will need to do to return to the greatness that once was what Ronald Reagan called "that shining city on a hill." As she reveals to us the depths of her knowledge on things like the natural order and the desire to be free, she tells us simple things in complicated ways so that the intellectuals will understand it as well. She was criticized for telling us complicated things in simple ways, so in the words of General MacArthur, she decided not to retreat, but to advance in a different direction. And as the flicker of twitter turned to the young flame of a facebook page, the light grew brighter. And as the light brightens again, flaming out into a book called "Going Rogue: An American Life," we begin to see the masses looking to a light we knew as the beacon of freedom. That beacon of freedom, which must once again be placed at the center of our nation's image for all the world to see, is now being held in the hands of a leader in exile who is mocked by those in power who fear her and revered by those in the wilderness who simply, simply just want to come home. We see the crowds gathering. We see heads turning toward the light and we see people beginning to move en mass. These people revere our founders, our founding documents and the dream upon which our great nation was formed and they are willing now to travel the long hard road from a political tundra, through mountainous terrain, across open plains and down through the deserts. They will suffer the harshest of winters and the hottest of summers as they make their way out of the political wilderness, now having been given a map which began to unfold at a speech in Hong Kong and which will continue to unfold as we cross rivers and valleys, fight tumultous thunderstorms and tornadoes and crawl through the dust and the dirt. Our leader will be bruised and bloodied. She will be skewered with rhetorical swords while simultaneously being showered with shouts of adoration and encouragement. Her head will be held down in the waters of insolence, yet she will keep the lamp held high enough so as the flame not be doused. We will take wounds for her. We will speak out and offend. We will squabble with our families and friends. We will put those around us on notice that while we agree to disagree, we will not falter and we will not fail in the intensity with which we will fight to save our great nation and the great lady who we want to entrust it to with all of our loyalty and all our heart. There can be no other way. If we are to make our way back to that shining city on a hill and plant that flame high above the halls of power once again, we must be committed to withstand the slings and the arrows which will come our way. We must continue to move forward and as our army takes Virginia and New Jersey, then House districts throughout the land, we will secure the positions needed and we will fire the deadliest of shots from the ballot box. War weary and driven, we will be across the mall from the White House, resisting it not only from the street, but from the floor of the House of Representatives. And as we approach 2012, we will march in unison, Romney fans, Huckabee fans, Pawlenty fans and fans of those who may not have taken the movement's reigns but who will soon be part of the government that the movement will create. We will be one. And Sarah will be our leader. Sarah Palin will stand perched over the crowds at her podium and microphone as the city on a hill once again shines in its renewed glitter. And as she gives an innauguration speech, the likes we have not heard since 1981, we will cry tears of joy and hug each other tightly knowing that we have done something the founders would have died for. We will watch Sarah Palin, our president, tell us that the days of the nonsense are over. We will watch her tell us that the people, the grown ups are now back in charge. She will look up to the sky and say "Mr. Reagan, because of your dream for us we have traveled a long hard road with liberty's lamp guiding our steps and opportunity's arm steadying our way. We have not forgotten that dream and we are home now."